If you’re getting ready to pop the question but are having trouble finding a ring that’s as special as your bride-to-be, you’ll love this selection of unique women’s diamond rings from Titanium-Buzz. We’ve designed a well-rounded selection to ensure that the style you pick completely wows her, regardless of whether she’s the traditional, trendy, or rugged type. From royal princess cut to stately square and everything in-between, Titanium-Buzz is committed to helping you find a style that matches who she is. These aren’t everyday jewelry store rings. These are handcrafted works of wearable art that aren't available anywhere else. 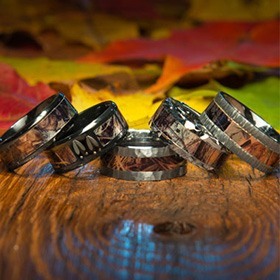 Treat your rustic-loving lady with one of our officially-licensed Realtree camo engagement rings or spoil your stylish gal with a pink diamond engagement ring if you’re looking for something totally different. If your lady is a bit contemporary, she’ll love our collection of modern tension set bands and solitaire rings that offer that simple yet sparkling engagement ring flair. Titanium-Buzz’s women’s engagement rings are American-made and designed for long-lasting quality. They’re created from and accented with tough and beautiful materials like cobalt chrome, sterling silver, 14-karat rose gold, 14-karat white gold, 18-karat gold, and titanium. Our team handcrafts and hand finishes each ring to ensure that it looks like a million bucks when we’re done. 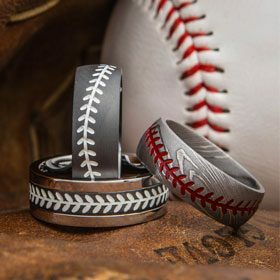 In many cases, rings can be engraved. 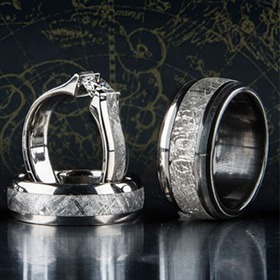 As long as the ring is wide enough, we can add a custom engraving for a special finishing touch. Additionally, some of these rings can be ordered with multiple options for stone sizes to match your specific aesthetic and budget, including affordable cubic zirconium, if desired. 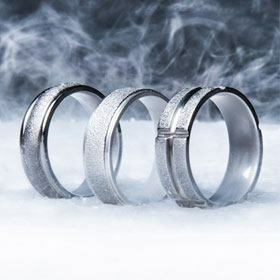 Titanium-Buzz can also help you figure out which ring size to order without tipping off your girlfriend that you plan to propose. Read our FAQs section for more information on sizing. Want to make her a custom engagement ring with the help of the Titanium-Buzz team? We’re on it! Reach out to us today and we’ll get to work collaborating the perfect style just for her. Find the wedding ring that will fit to your personality among our new models.